Of the fifteen or so recipes that I brought home from northern Thailand last year, nam prik dta daeng is my favorite. 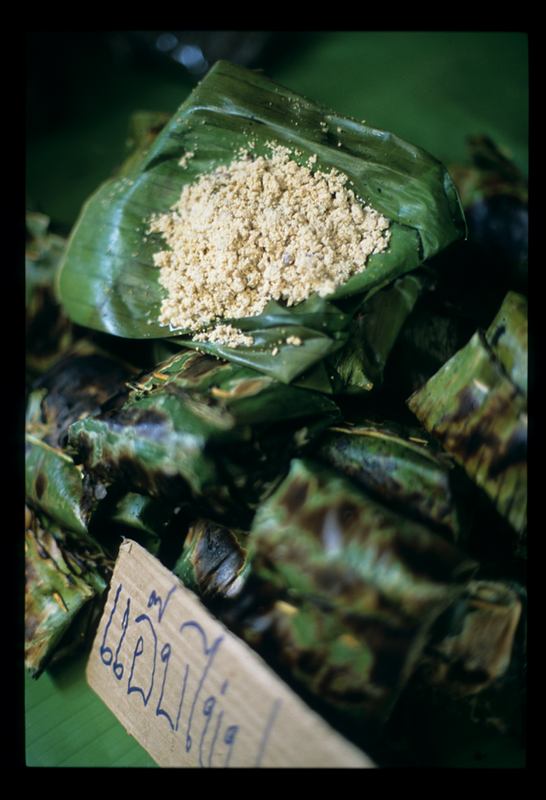 Nam prik are Thai 'dips' eaten with blanched or fresh veggies and, in northern Thailand, plenty of glutinous rice. 'Dta daeng' means 'red eye' and Mon, the Nan (a northeastern province bordering Lao) native who showed me how to make this dip, believes that its name is a reference to the water that its heat brings to the eyes. 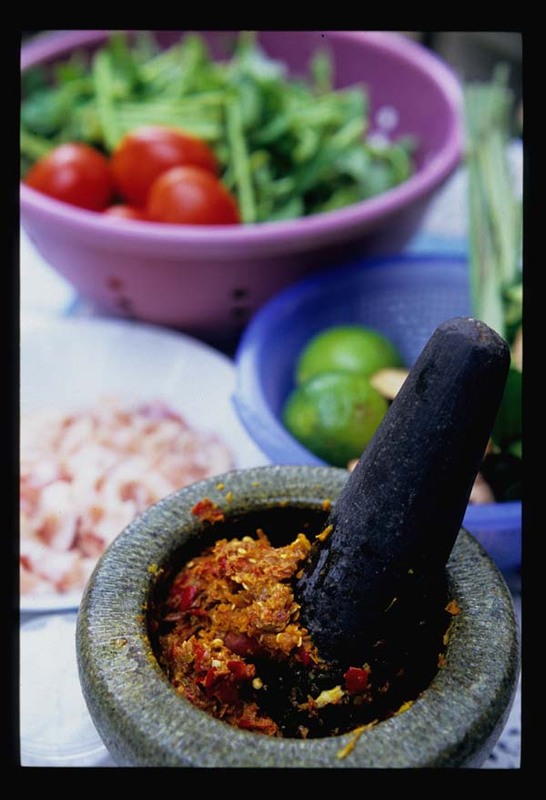 There are a number of variations on the nam prik dta daeng theme, though most versions include plenty of dried red chilies. 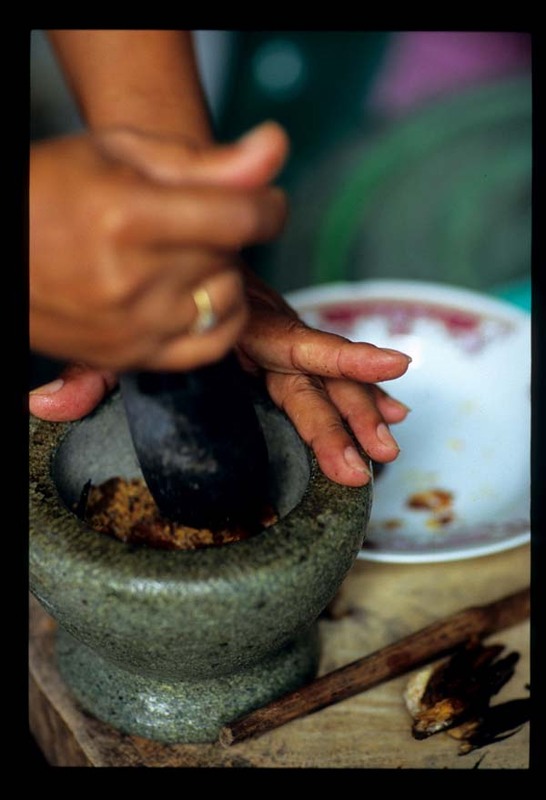 This northern, or Nan-style, nam prik dta daeng features smoked fish. The Nan River courses right through Nan town, separating its laid-back commercial center from the rice paddy and corn field-studded eastern 'suburbs'. 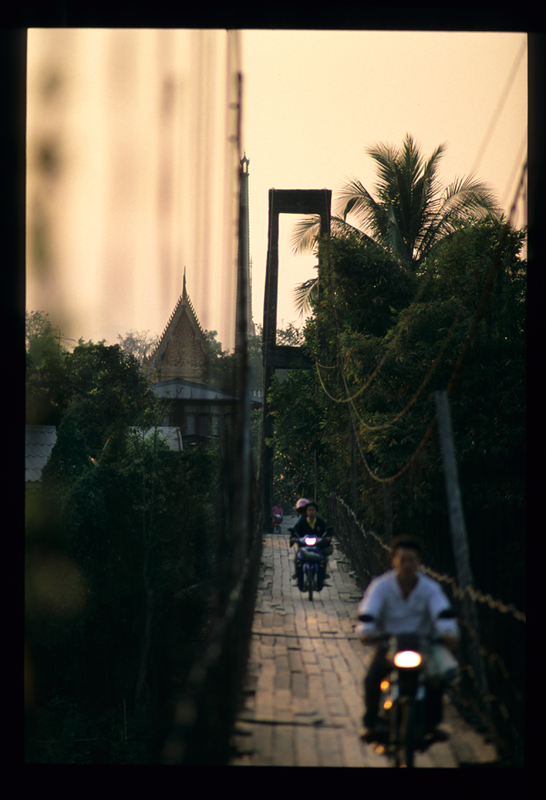 The wide river is low and sluggish in the dry months, considerably higher during the rainy season (the suspension bridge pictured above was washed away in last year's September floods). Longboat races are held on the river every year to mark the end of the Buddhist rains retreat. 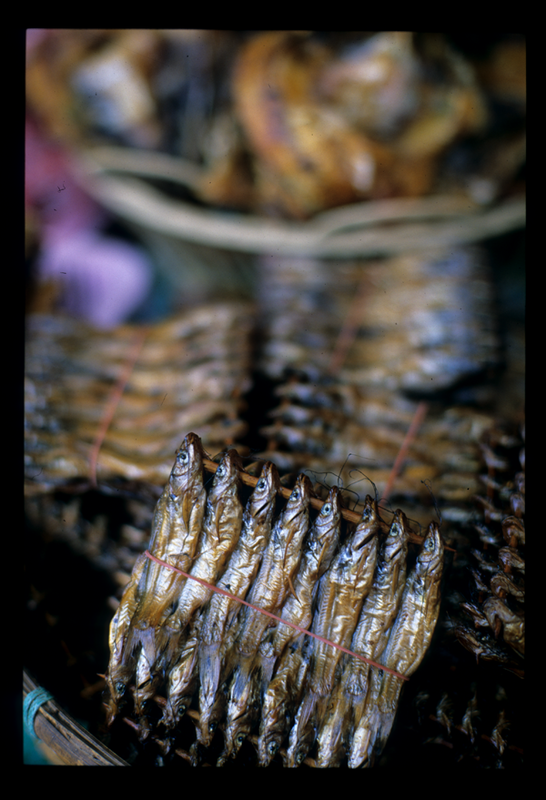 and logs of bplaa som, raw fish fermented with rice and shaped into big sour 'sausages'. Nam prik dta daeng might just be one of the simplest Thai dishes you'll ever make, especially if you forgo mortar and pestle in favor of blender or mini-chopper. 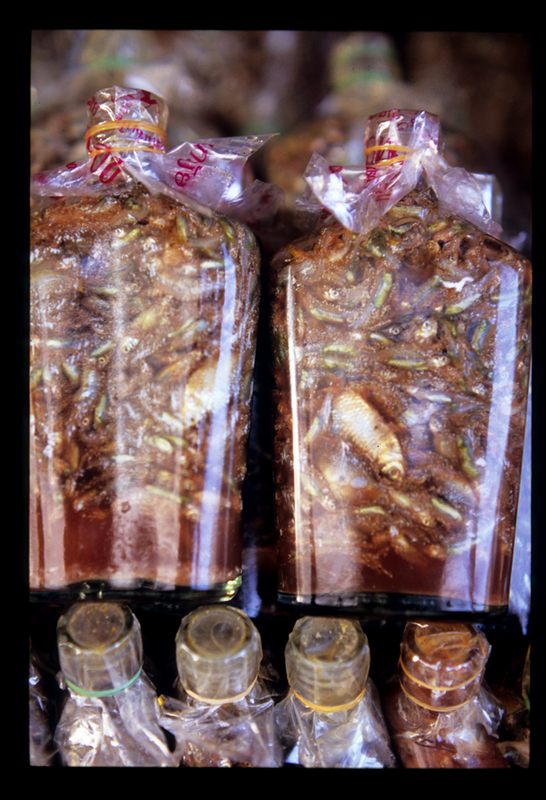 Ingredients are few: dried chilies, garlic, shallots, tomatoes, shrimp paste - and, of course, smoked fish. Before it's incorporated into the dish the fish (Mon used a butterflied specimen similar to those in the third photo from the top) is crisped - over coals, traditionally, but in a microwave in Mon's kitchen. Garlic and shallots are softened (microwave, again) and, along with the fish, pulverized in a mortar with toasted red chilies. 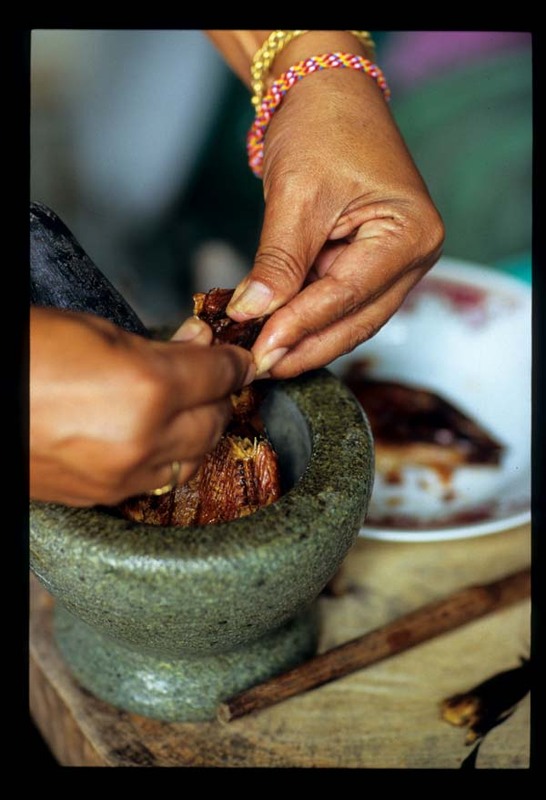 Tomatoes are softened in a skillet, shrimp paste added and cooked until its ammonia-like odor dissipates, and then the fish-chili paste is added to the mix. It all cooks for a bit over low heat, taking on a lovely brick-red gloss, and then it's done, ready to eat with raw vegetables and sticky rice. Nam prik dta daeng's appeal can't be overstated. It's fishy, but not overly so, and the shallots and garlic lend a mellow, caramelized note. Mon's version is very, very spicy, in that hurts-so-good kind of way that urges one back for more even as the tongue and upper palate beg for mercy. It keeps at least a week in the fridge and leftovers are wonderful stirred into scrambled eggs or spread on toast or a cracker. 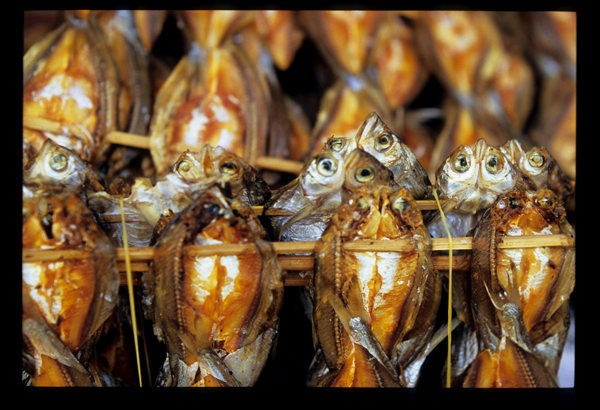 Smoked mackerel is a fine substitute for the river fish that Mon uses. It results in a smooth, extra-rich dip. Very spicy - reduce the number of chilies to soften the blow. You could also add a bit more tomato to balance out the heat. 1. Remove any skin from the fish. Microwave until it exudes any moisture and begins to crips, about 3-5 minutes depending on the fattiness of the fish. (This is messy - be prepared for a good splattering of oil on the inside of your microwave). 2. Place garlic cloves on a plate and cover with microwave-safe plastic wrap. Wave till very soft and starting to brown a bit on the outside, about 2-3 minutes. Repeat with the shallot, which will take a little longer. Cool and then peel. 3. Toast the chilies in a dry skillet over medium heat, stirring often, till they darken but are not burned. 5. Place a nonstick skillet over medium heat. Add oil and then tomatoes and gapi together. Cook, stirring occasionally, for about 3 minutes. Add water and continue to cook, stirring and mashing the tomatoes with the back of your spatula or spoon, until the moisture has almost evaporated and the smell of the shrimp paste has subsided a bit. 6. Add the chile-fish paste and cook, stirring, until it has started to darken and take on an oily sheen, about 4-5 minutes. There should be no moisture left in the pan and the paste should be thick. 7. Serve at room temperature with veggies and sticky rice. What a fascinating post! I feel like I took a little trip around the world. ps. I dont know if you'll remember our previous conversation about Asian cuisine and vegetarianism, but we finally took a leap and started making Asian food! Not "authentic" because there is no fish sauce when it's called for, but as close as we can get! Such delicious photos! the fish in the whisky bottles looks so interesting. Wow! I want fish in whisky bottles! I love chilli when its "hurts so good"
Ari - yay! The next time I across a particularly good Asian recipe w/o fish sauce, I'll send it your way. Nate - thanks. I'm wishing we would have carried one of those bottle home to see what the contents tasted like. Steamy Kitchen - you and me both. The hotter the better. Excellent pictures. Would love to try those fish one day. Nolan, thanks. Smoked mackerel makes a really nice version too - give it a try. These fish photos are simply fabulous!